You are seeing a 3mo old with clinical bronchiolitis who is otherwise well-appearing, tolerating po’s, not in significant respiratory distress, afebrile, has good follow-up. 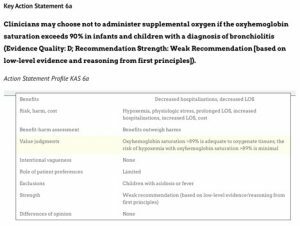 At what O2 sat do you admit the patient for supplementary O2? 90%. We use a pathway algorithm to determine who gets admitted for bronchiolitis. If it’s share-able would love to see it! Or you could summarize it. And sorry the poll was not showing initially – I entered your vote for you.